James “Lee” Ingle was born in Houston, Mo. on November 16, 1964 to Walter “Walt” Billy Ingle and Hazel Rosetta (Gale) Ingle. 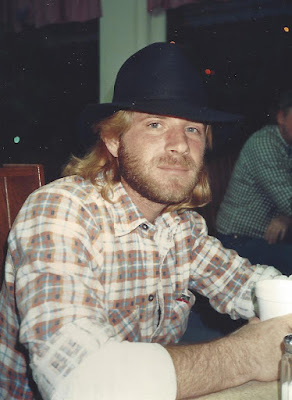 Lee passed away February 11, 2019 at the age of 54 in Springfield, Mo. surrounded by his family. Lee always made his family a priority in his life. Lee married Donna Lewis on September 7, 1985. To this union two daughters and one son, Jamie Amanuel, Cassandra Ann Marie, and Billy Austin were born. He devoted his life to raising and caring for his daughters. Lee loved spoiling his grandson and great nieces. His hellos and goodbyes were always raspberries. Lee was a jack-of-all-trades. He could build a playhouse, fix a fence, and was handy with a wrench. You could always find Lee driving his lawn mower around Gale’s Hill visiting his family. In their early years, Lee and his cousin, Dewayne carried on the hitchhiking tradition of their dads, Walt and Doug. One of Lee’s greatest attributes was that he could not tell a lie. He was honest to a fault. Lee is preceded in death by his father, Walt; sister, Valerie; son, Billy Austin; grandson, Curtis Allen; grandchild, Baby Honse; and mother in law, Shirley Lewis. He is survived by his mother, Rosetta “Rosie”; daughters, Jamie Amanuel Richardson and husband, Loren of Licking and Cassandra “Cassie” Ann Marie Honse and husband, Doug of Rock Valley, Iowa; sister, Joyce Chapman and husband, Phillip of Edgar Springs; grandson, Henry Roy Richardson; special niece, Mickie Lynn Chapman of Edgar Springs; great nieces Athena and Jacey. Lee is also survived by his extended family Donna Lewis, Frank and Evelyne Lewis, Ellen Newkirk and husband, Michael, Alice Huey, Sandy Jennings and husband, Gerald, and Christina Boothe and husband, Gary. He will also be greatly missed by his faithful companion, his dog Gator, along with a host of nieces, nephews, and friends. A memorial service for Lee was held on Saturday, February 16, 2019 at 11:00 a.m. at Fox Funeral Home, 128 S. Main St, Licking, with Pastor Everett Perkins officiating. A visitation was held one hour prior to the service. Arrangements entrusted to Fox Funeral Home. Online condolences may be left at www.foxfh.net.